Growing up in an orphanage, Leila was bullied for being different. She turned her hardship into skill by becoming an escape artist--a valuable trait when you belong to a group of magical best friends. But when a famous psychic comes to town, Leila and her pals can't escape the big mystery heading their way. Whether chasing mad monkeys or banishing ghosts from haunted hotels, these six friends will do their best to keep their home of Mineral Wells safe--but can they protect themselves? 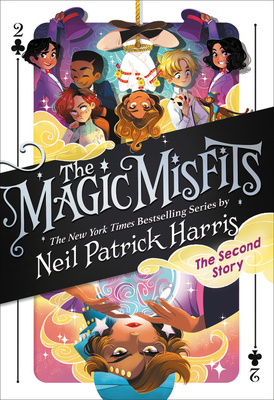 Join the Magic Misfits as they discover adventure, friendship, and more than a few hidden secrets in this delightful new series. Whether you're a long-time expert at illusion or simply a new fan of stage magic, hold onto your top hat! WHERE? A sleepy town in New England. Within the town is a magic shop, run by the friendly but mysterious Dante Vernon--the gang's caped and top-hatted mentor. WHY? Because together, these six magical misfits will discover adventure, friendship, and the town's long-hidden secrets. Neil Patrick Harris is an accomplished actor, producer, director, host, author, husband, and a father of magical twins. Harris also served as President of the Academy of Magical Arts from 2011-2014. His memoir, Choose Your Own Autobiography, was a NY Times Bestseller. The Magic Misfits was his middle grade debut.